← A Love Letter to 2016, postscript: the list…and a brief look at what’s in store for 2017! This two-person interview appeared in Febri vol.34, which was released in April of last year, after the first season of the show. I had originally planned to have the entire interview translated and checked before the second season started, but unfortunately, a certain anime about figure skating derailed just about all of my translation plans in the fall season. Hence, this is just the first half of the interview; it is also the more controversial half. Since these two seiyuu are people that I’ve never translated or even read interviews with before, and haven’t had the chance to ask anyone else to check it, there may be a few mistakes here and there, which I hope you will forgive me for (if you happen to have read the interview in Japanese and spot any, please let me know!). As usual, please do not copy and paste more than a sentence or two elsewhere, though feel free to link to it if you wish. And even if it suggests something that goes against your interpretation of the show, I hope you’ll find it as interesting as I did. A fateful bond1 is a strange thing… Ungoverned by logic and reason, such are the relations between men and women. The relationship between Kikuhiko and Miyokichi, too, is filled with incomprehensible matters. How did the actors behind these characters portray such an afflicted relationship? In this discussion, we ask the two of them to share the depth of their feelings towards the show and their characters. —The two of you have acted together on many different shows, beginning with Slayers where to you played Lina and Xellos, and Neon Genesis Evangelion where you were Ayanami Rei and Nagase Kaworu. How did you feel when you found out that you would be acting together in this show? Ishida: When I found out that Hayashibara-san would be my counterpart, I was like “Oh boy, what a frightening partner…” in a whole range of ways. Ishida: Oh, no no (chuckles). As everyone is well aware, you’re an incredible actor, right? Such a person is probably rather strict with themselves, and also with those acting beside them. At least, that’s what I figured. Ishida: Like, if I tried to fake it, at my level, you’d see right through me. You’d see through me no matter what I did, so I put myself on guard right from the start. Ishida: It’s especially true for this anime, but even for the other shows we’ve worked on together, I’ve always thought that you’re someone who makes the people you are acting with rather tense, no matter what the atmosphere of the studio seems like on the surface. Hayashibara: Is that so…how interesting! Ishida: “There’s so much pressure just in the fact that I have to do rakugo…and on top of that, I’ll be working with Yamadera (Koichi)-san and Hayashibara-san, huh? Good heavens…” That’s pretty much what it felt like (chuckles). Hayashibara: As for me, I was offered the part only after Yamadera-san, Ishida-san and Seki (Tomokazu)-kun had all been cast. So somewhere in the back of my mind, I feel that, if it hadn’t been you and Yamadera-san in those roles, then it probably wouldn’t have been me either. I’m not sure what it is, perhaps the balance of our voices, or our mindsets, or perhaps the wavelength we’re on, or our bonds in our previous lives (chuckles), but we just match, somehow. It was the same when I did Cowboy Bebop. (Ishizuka) Unshō-san and Yamadera-san were chosen first, and then I came in as the voice between them. —After you started recording, could you tell us about what you sensed and took from each other’s acting? Ishida: It was like Miyokichi was moving the story along at my pace, in a good way. Or perhaps, I felt that it was good that they met when the story was moving along. Just as I was becoming comfortable with the atmosphere of the studio where we were recording Rakugo Shinju, Kikuhiko was becoming comfortable with Miyokichi—this is probably something that men tend to do, but it felt a bit like a part of me was standing somewhat above her, looking down on her. I’m really glad that there was such an overlap, where the way that my character became familiar with his partner reflected my own experience in the studio. Hayashibara: As for me, rather than being able to ‘take from’ Ishida-san’s acting, it was all I could do to try and grasp who Miyokichi was. I’m sure that Ishida-san and Yamadera-san both struggled with and spent a lot of time thinking about their own characters as well, but from my perspective, they were already Kiku-san and Sukeroku through and through. How could I slip into the space between them as Miyokichi? I wasted a lot of time during the recordings for the first half of the series trying to figure that out. Was Miyokichi a difficult character to play? Ishida: (chuckles) Well, if I pick up the thread from what Hayashibara-san has just said, then Kiku has probably never thought that Miyokichi was an idiot. He knows that she’s someone who has used a range of wiles to survive, to get to where she is now. And because he sees her in this way, what he feels for her isn’t the kind of romantic love held by the average, modern high schooler who’s in love with his or her classmate.2 But when she’s there beside him, he finds himself responding to her allure. He’s quite pitiful, after all. In that way, he lets himself be influenced by her, but at the same time, he’s cooly looking at himself, saying “This isn’t romantic love.” And he probably thinks of himself, of this person looking on so cooly, as “a real slime-ball,” too. But he is simply unable to throw away the feeling of comfort that he gets from being by her side. He’s a weak guy…or rather, he plays foul. In episode 8, he gets angry when he comes back from the regional tour and sees Sukeroku and Miyokichi in an embrace, doesn’t he? Personally, I don’t think he was that angry, not really (chuckles), but I also kind of understand why he was upset. Even though he didn’t regard himself as being in love, he gets irritated at the thought of parting with her. So, I also have to reflect on my performance, just like Hayashibara-san. That scene where Kiku says “I am (being a man). This is the greatest lie of my life”—when we recorded it, I went into the scene taking those words quite literally. But now that I think about it, it’s not like Kikuhiko was prepared to keep their relationship going—and that thought was probably in the back of his head, too. Hence, I’m sure that what he said to Sukeroku was, at some level, a lie aimed at deceiving himself as well. Hayashibara: There are so many emotions on the other side of “I love you” that we no longer know which of them are right and which of them are wrong. In particular, in the middle part of the show, I felt like I was waiting for the directors’ guidance with regards to what was coming out of me naturally at that time. But if we think about it, that’s what real romantic love is like. It’s not like you’re reading out a love letter that expresses everything clearly in a set number of words. The attitude your partner takes at any particular point also changes the words you use, and it’s not as if it will play out the way you have planned. In that sense, even those elements of my performance that I thought may have been incorrect, may have been right as far as results go—I’ve been trying to think about it along those lines without trying to justify myself. Beyond that, all that remains is to leave it up to the viewers to decide how they feel about it. —How do the two of you perceive Sukeroku? Ishida: He’s someone who is real to the bone, with no artifice. Hayashibara: Yup, I’m with you there. And that’s why he gets messed up (chuckles). Miyokichi envied him, just because he and Kiku-san got along too well. Something may have happened in Manchuria as well, but she simply has no interest in a guy who foolishly pursues her, so openly, too, despite knowing that she’s his master’s mistress (chuckles). In the end, a man like Kiku-san is more appealing to her—someone who fights to restrain himself, thinking “I can’t touch her because she’s my master’s,” but who gradually loses that fight and lays his hands on her. Hence, if Kiku-san hadn’t gotten involved with her, I don’t think she would have taken any interest in Sukeroku. —And that did not change even after she took him back to her hometown? Hayashibara: Because this was her revenge. But since Sukeroku just has so much warmth about him, I think that being with him may have felt comfortable to her. In that sense, she may have felt at times that he was causing her to forget (what she wanted). With Kiku-san, he’s so cold that she feels that she has to warm him up, but Sukeroku is just warm, unconditionally warm. Like the stomach of a golden retriever (chuckles). That kind of warm, comfortable feeling. —As for Kikuhiko and Sukeroku, it was like they had a shared fate through rakugo, but it was ripped apart because of Miyokichi. How have you interpreted that aspect of the story? Ishida: Kiku probably wouldn’t have ever imagined that, as a result of him dumping Miyokichi, she would move to the countryside with Sukeroku. And there’s no way he would ever have wanted such an outcome. Hayashibara: But if I look at it simply as a viewer rather than from Miyokichi’s perspective, whether she had been there or not, I feel that it would have been difficult for Sukeroku to continue doing rakugo in Tokyo. He would probably have distanced himself from Kiku-san, don’t you think? Ishida: I suspect that Kikuhiko probably didn’t think of such a possibility. Sukeroku was getting a lot of backlash because of what he was doing, what he was aiming for, and causing a lot of problems as a result. But fans were also full of praise for for his amazing performances. Hence, although it would have been best if Sukeroku did not cause any problems, if he did, then Kikuhiko intended to continue backing him up. And I think there was still quite a way to go before he ran out of patience. Hayashibara: I see…then Miyo-chan did indeed take Sukeroku away… That girl really is no idiot. The “revenge” that Kumota-sensei spoke about was that very act. What a fascinating interview! The characters are so flawed and multidimensional, and their interactions are so layered, that even the voice actors struggle making sense of their characters and still change their minds after the scenes have been aired. All hats off to Kumota-sensei for creating such an intricate story and the anime production team for raising the story to another level! Ah, I didn’t figure out that Miyo has probably started her revenge when she saw Sukeroku then. Miyo is such an interesting character. I’m also always of the opinion that Kiku has always been taking advantage of Miyo and was never really in love with her, so I agree with Ishida here. Kiku seems pretty manipulative and self-serving to me. Definitely didn’t vote him for Best Boy! 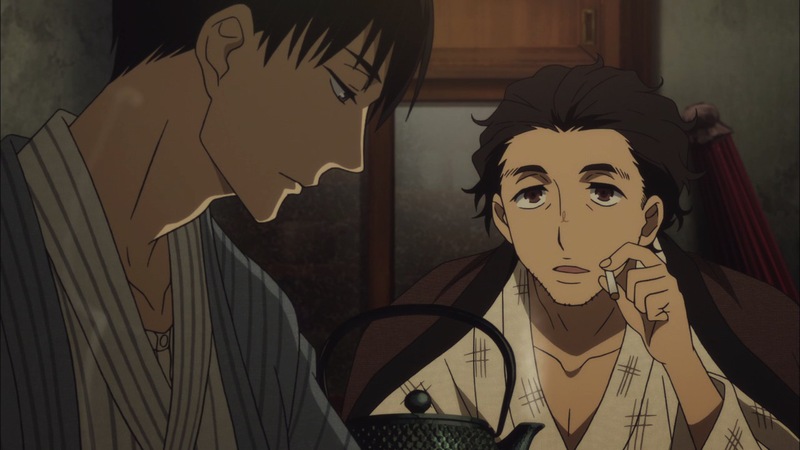 I think SGRS show us just how complicated and difficult love is, whether that is romantic love, love for a partner/brother/friend, love for mentor, even love for one’s pursuit (in this case, rakugo). There’s so much selfishness involved, and that love can turn into hatred too. I’m really excited to see the second season – not just to see what happens to Kiku or what really happened at the last confrontation between Kiku-Miyo-Sukeroku, but also what themes SGRS would explore. Thank you so much for the translation – I’m looking forward to the second half of the interview! Totally agreed! One of the reasons I wanted to translate this interview is because it made clear just how much more complex these characters were than so many viewers seemed to think. Watching the full 81-minute long version of the opening episode after seeing the entire first season revealed so much, and I’m trying to find the time to watch the entire series again so that I get even more from it! Yeah, I missed that thing about Miyo as well. I thought she was taking comfort for her broken heart from Sukeroku, but well… I’m a little afraid that this will make some people hate her even more, but the way Kiku treated her, stringing her on for 10 whole years like that, I honestly can’t be too harsh on her. But at the same time, I’d have to disagree and say that Kiku really did love her. 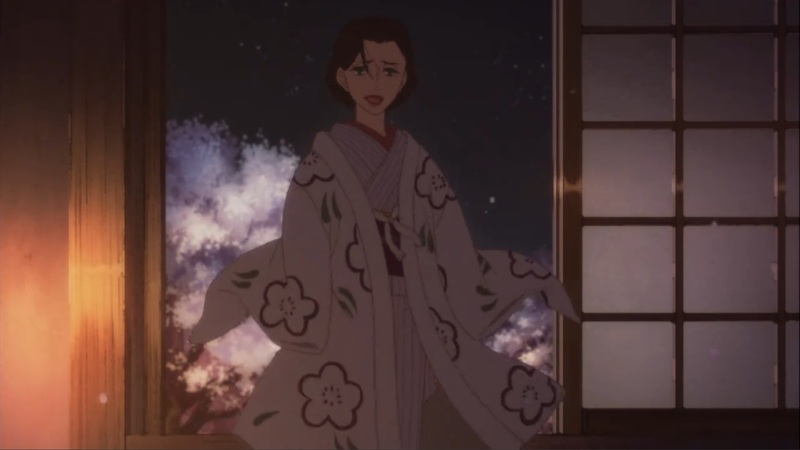 Compared to the other women we saw him date, I think it’s pretty clear that he was most drawn to Miyo .it’s just that he loved Rakugo more…and that’s why he really feels the weight of the tragedy, because it IS his fault. To be honest, since the manga is one entire story, I’d say that the same themes apply to both seasons of the show. It’s just that the second season may make them clearer to us, as it reveals Yakumo’s remaining secrets. My copy of volume 10 should now have arrived at my term address…and I’m going to try my best not to touch it until the end of this winter season! Ah, good luck on staying away from that volume 10! I’d be so tempted if I were you! I rewatched S1 after reading this and it does give a new light to the show. Now I agree with you: Kiku is attracted to Miyo. Maybe he cares for her in a way but as you say he loved Rakugo more. And despite his feelings (whatever that may be) he really wasn’t kind with his affections, and that did lead to the tragedy. I guess I have to go back to my other point…love is complicated. True, the same themes will apply to both shows. I guess I was saying that those themes will be explored through different characters with different personalities, like Yotaro and Konatsu, so there may be a different flavor to those explorations. But yes, in the end the big mystery will still be Yakumo’s remaining secrets. I enjoyed both parts of this interview a lot. Do please share more materials on SGRS if you happen to find any and have the time to translate them. This is such an amazing anime and I can’t get enough of it. Thank you so much! Haha! I’ve left it wrapped up in plastic on my shelf – not touching it until the show’s over! That said, I already know a few things about this second season, and I’m preparing myself for the feels! I will! 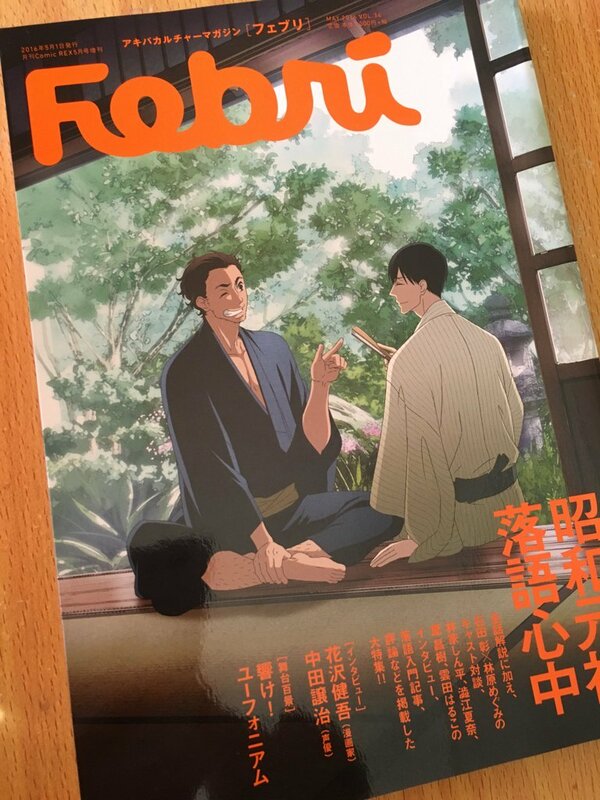 I’ve got a few interviews with Kumota-sensei that I want to read, and a special rakugo-related thing that I managed to get through a friend. So I’ll try to find time for Rakugo Shinjuu stuff, even with all the YOI madness that I’m still subjecting myself to! Thank you infinitely for taking your time to translate this! The complexity of the characters in this story is astounding and it was great to be able to see the insight of their voice actors on this. You’re very welcome – glad you found it useful! I love reading what the voice actors think when they’re so deeply invested in their characters. But I also really want to find out more about Kumota-sensei’s own thoughts on the story. If only there were enough hours in the day to read all of the interviews! And I hope you have a good day too! Like you, i didn’t think Miyo went with Shin for revenge but for comfort….. this truely puts a new light on the story…..how complicated their relationship…..the weight of guilt Bon must have felt up till even now. This story truely went straight to my guts……thanks for this translation! The rest of this story is really going to kill us, isn’t it?! Hello! It’s me again. How nice it is to come back to this gem of an interview after the last episode and seeing how it has garnered more attention! Season 2 is shaping up to be just as great as the first, maybe even better. I’ve actually influenced a friend to binge watch this show and now they’re mad at me because now they’re sucked into this emotional whole roller coaster of a show! (They think this is really good). Hmm yes, I agree it is a love triangle between Kiku, Miyo, and Shin…episode 12 hinted pretty strongly at that. I keep shaking my head at fans who think Kiku was only really attracted to Shin. Actually, I think it’s more like a love square if you put Rakugo in it, because love for Rakugo is a big part of their relationship. Like you, I think I’ve been majorly spoiled for this season and I’m also a bit scared at how things will be revealed….I want to know what happened but my heart – I don’t know if it’s ready! An interview with Kumota-sensei? Sounds fascinating! I can’t wait to read it. Good luck! And I’m glad to hear that your friend really likes it too! 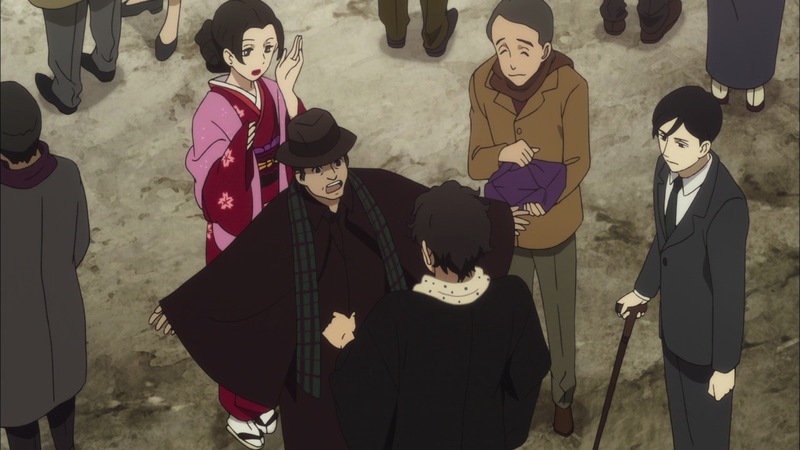 Hm…personally, I’m not sure quite where to put Rakugo in relation to the other two. 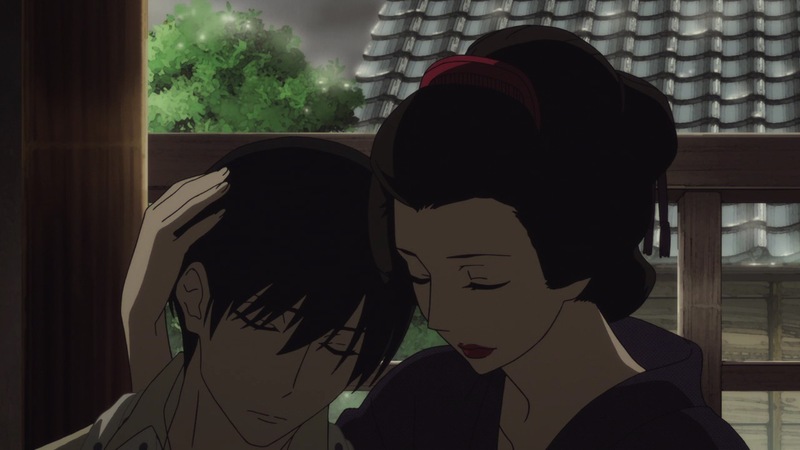 Making it out to be a square like that oversimplifies the characters, I feel–in particular, Yakumo’s attachment to it is connected to how it gave him a place to be. There are a lot of interviews with Kumota-sensei! I wish I could translate them all, but some of them are just too long! But I’ll start work on this one this weekend. I feel bad for doing things out of the order I said, but I think I’m going to try and finish a long-overdue YOI interview tonight ^^; Glad you like the same parts of YOI as I do, as that’s the bulk of what I’ll be writing about as well…well, when I finally get around to it!